(Phys.org) —A team of researches with members from the Netherlands and Nepal has completed a study of the expected changes to mountain runoff in Asia due to global warming over the next half-century. In their paper published in Nature Climate Change, the team predicts warmer temperatures will mean more runoff due to melting glaciers and snowcaps, and likely more precipitation as well, at least in the near term. As global temperatures rise over the next century, researchers across the globe are attempting to predict how their part of the world will be impacted. While most areas are expected to grow gradually warmer, some are expected to become wetter, and others drier. Also, some areas are expected to see different changes in the near term than farther down the road. One of those areas is High Asia, which the researchers with this new study predict, will see an increase in water flowing down from the mountains in the near term, and then a major decrease later on. The research team constructed high resolution models to mimic what they believe conditions will be like in the mountainous regions of Asia, as global temperatures rise. 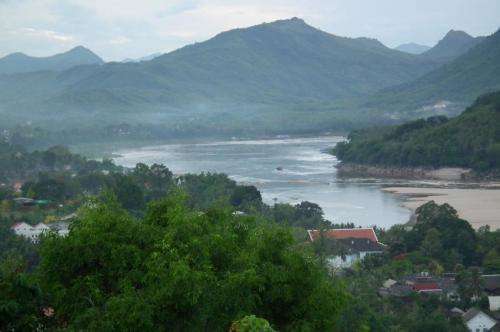 Their models demonstrate the predicted impact of warming temperatures on five regional river basins: Indus, Ganges, Brahmaputra, Salween and Mekong, which they note, collectively support approximately 1.3 billion people in a dozen countries. The models show a gradual decrease in the average extent of glaciers as they melt, which would quite naturally lead to a decrease in river runoff. That decrease would likely be more than made up, however, by an increase in water from the melting ice. The area is also expected to benefit from an increase in precipitation as temperatures rise, adding even more water to runoff. The people in the area, the team predicts, likely won't notice much change in water levels until at least 2050. One exception, they note will be runoff from the Indus, which their models show would experience more than average runoff over the next several decades, mainly due to glacial melting. After 2050, however, significant reductions in runoff appear likely in all of the studied river basins as glaciers slowly disappear, leaving little ice to melt and run down the mountains. Rivers originating in the high mountains of Asia are among the most meltwater-dependent river systems on Earth, yet large human populations depend on their resources downstream. Across High Asia's river basins, there is large variation in the contribution of glacier and snow melt to total runoff, which is poorly quantified. The lack of understanding of the hydrological regimes of High Asia's rivers is one of the main sources of uncertainty in assessing the regional hydrological impacts of climate change. Here we use a large-scale, high-resolution cryospheric–hydrological model to quantify the upstream hydrological regimes of the Indus, Ganges, Brahmaputra, Salween and Mekong rivers. Subsequently, we analyse the impacts of climate change on future water availability in these basins using the latest climate model ensemble. Despite large differences in runoff composition and regimes between basins and between tributaries within basins, we project an increase in runoff at least until 2050 caused primarily by an increase in precipitation in the upper Ganges, Brahmaputra, Salween and Mekong basins and from accelerated melt in the upper Indus Basin. These findings have immediate consequences for climate change policies where a transition towards coping with intra-annual shifts in water availability is desirable. Increased precipitation is what drives mountain glacier growth. The polar bears will be fine. It also drives higher runoff you denialist dimwit. Not if it's rain, you tart. There is obviously an increase in the diarrhea spouted by the AGW Chicken Littles.